Earlier in the week I found myself with exactly 2.5 hours in which to sew, when fate collided to place one child at a friend's house and another on a large inflatable raft having a hose pipe squirted at her (apparently it was more fun than you could ever imagine). Such a small window of time put a stop to all my usual shilly-shallying over fabric choices. I went straight to some cheerful Anna Maria Horner voile Little Honey in Ink that I bought last summer and took my sheers to it. The pattern is my own - a mixture of several tops that I've made in the past. It would have been completed inside the 2.5 hours, had I not sewn the entire neck binding in place before suddenly remembering a top of Kate's that I'd fallen in love with. The thought of it made me think how much I'd like to have a pleat, rather than gathering at the neck (which is what I had there at the time). In reality I can see now that my memory of Kate's top wasn't overly accurate since hunting it down to show you here (her top is far more graceful and elegant than mine and has good deal more pleat action going on) but it was the inspiration for wielding a seam ripper on the freshly stitched binding - thanks, Kate! I can't remember exactly where I bought this fabric now, but a quick search online reveals that both Ray-Stitch and Saints & Pinners still stock it this year. 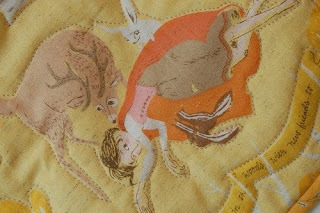 ﻿The Little Folks voiles range is one of my favourite Anna Maria Horner's fabric lines ever - it is making me feel a little panic stricken that the time may come when this collection is obsolete. I'm sure this fabric would make a wonderful dress for a child too...I think that was the purpose for which I'd chosen it originally actually. Oh dear. Selfish Mummy. A few months ago, the very wonderful Heather Ross mentioned the Ed Emberley drawing books on her blog and how much she'd loved them as a child. I bought a copy of his Drawing Book of Faces from Amazon then, but didn't give it to my children until yesterday. It was met by oohs and aahs and we all sat down with some paper and pens and happily started working our way at random through the pages. Top: by my daughter, Middle: by my little boy, Bottom...um, by me. Ed Emberley's books are amazing - they have rows and rows of drawing sequences that show you how to build up from the initial shape to the finished picture, indicating the lines and shapes that need to be drawn at each stage. This appeals to me as it's the way that I taught my daughter to draw when she was very small, although with a lot less visual appeal than Ed Emberley. Wanting to draw a picture of a house as a toddler she was overwhelmed, until it was broken down into a series of sequentially drawn squares and rectangles...it's the same with wishing to draw a horse as an older child - it's helpful to have it fragmented (that's where we really need Ed....horses have always foxed me and my daughter has long outgrown my rudimentary drawing instruction). As well as his Faces book, we are also tempted by his Drawing Book of Animals , and perhaps most usefully, his Make a World book, which covers the drawing of most things you might like to include in a picture. I know that some might dislike this formulaic method when it comes to childrens' drawings, but for me, I think rather than removing creativity, it enables it. Once the elements that make for a well drawn face or horse are demonstrated, it's then a springboard for creativity, producing things that look like the artist hoped they might, rather than feeling frustrated that things never come together on paper as they do in one's head. They make for perfect rainy-day summer fun...or even early morning fun, as I was greeted by the book and a small boy coming into my bed at 6.30am this morning. Do you have any similar book or activity recommendations? A few months ago I picked up this beautiful footstool at a vintage fair. I had intended to recover it before using it as the fabric is a little grubby and stained in places. But somehow many weeks have passed and it has stayed just as it was when I bought it. The fabrics are beautiful and much of the the stitching on it has been done by hand. The workmanship is naive and homely, which somehow makes me love it more. I think the only thing that will eventually prompt me to replace these lovely fabrics is that our cats are currently using them as a scratching post...although this may also be the very thing that makes me lose the will to recover it. How to stop the little beasts? Recently me and my daughter went to stay with my sister for a weekend. You might recognise the fabric as one of the fabric swatches that was in my kitchen window sill waiting to be decided upon in this post...I'm still no closer to deciding which fabric I should have in my kitchen, but I had mentioned in that post that this fabric reminded me of my sister as she loves this shade of blue. Later that day she emailed me to say she did indeed love it the moment she saw it and was so happy to then read that I'd guessed that she would. I decided to make her a little something from it when we went visiting - I used my own drinks' coaster tutorial because my memory is so sieve-like it's quicker to go and follow my own tutorial than try to think through the steps all over again. I made it several inches bigger than the drinks' coasters though, so that she might use it as a pot stand. I wanted to piece the fabric, rather than just cutting it as one square, as it has such a strong directional print and I never like having something that only looks right when you stand at a certain angle in the room if it's going to be placed on a horizontal surface. However, after I'd cut the fabrics using my beloved Go! Baby cutter and then pieced them together, I realised that I had stumbled upon a flaw with the machine...it's impossible to fussy cut using it. This wouldn't bother me most of the time, but each time I looked at the block on the right I felt niggley every time I saw all the jarring angles of the print and looking at them made me feel like I was about to pass out with misery imagining that my sister might be as disturbed by them as I was. So I used the cutter to cut a half-triangle paper template (no, this isn't like using sewing scissors to cut paper with - apparently it's allowed) and then cut out each triangle individually with scissors. By the time the block on the left was pieced together I could feel my equilibrium beginning to return. And I realised that there is a reason why it is called Fussy Cutting when you take care over how a fabric is cut...it's probably because it's the preserve of fussy people. I dislike myself for minding...it's the same bit of me that wants to colour co-ordinate the baubles on the Christmas tree and do lots of other fussy, horrible things....but somehow I still do. How do you cut your fabrics? Do you always fussy cut them when you're patchworking or do you tend to vary it depending on the fabrics you're using? It's not something I've paid a huge amount of attention to in the past, but this particular fabric made me think on it for the whole time I was sewing that day. ﻿Here it is at its new home on my sister's dining room table. Like me, she loves soup: so this her official soup bowl mat. Firstly, please forgive the awfulness of these photos - they were taken in really poor light, but I wanted to share them with you anyway, as they show the toile that I made for the Miz Mozelle dress, before cutting into the lovely Liberty fabric. Try to ignore the unfinished hem and the fact that the belt is just a strip of torn fabric! You might remember that in that post I talked about a couple of fitting issues and you can see here why I made the keyhole smaller at the neck. For these photos, I had cunningly angled the dress so that my bra was not on display, but you'll have to believe me that there are indecency issues with the toile. Making toiles can feel like an unaffordable luxury: even cheap fabric is expensive and for this I needed to try it out in a stretch fabric, which tends to be doubly difficult to find inexpensively. However, I was lucky enough to find some beautiful quality stretch fabric in my local sewing shop, that they'd been disturbed to find left your hands looking a little inky on handling. They were selling it off for £2.50 a metre, so I bought nearly all they had and washed it along with half a pound of salt once home to seal the colour. It's now perfectly colour-fast and was very much worth buying. Best of all, this type of dress works with my favourite shoes, which I'm completely loopy about. My sister and I spotted them at the airport when we flew out to Russia, but as I said a few posts ago, I rarely make impulse purchases. I'm so pleased I didn't in this case, as they leapt onto my feet in the Radley sale for half the price. They also came in shocking pink, which could have been fun. We are off to our first wedding of the summer this weekend. You might notice from these photos that my legs are an attractive shade of milky white: I must remember to unleash my bottle of tan on them. Earlier in the summer I did just that and then wandered off downstairs and joined my husband in a shot or two of the vodka that I had brought back from Russia with me in May. By the time I came back upstairs, having caught sight of my legs in a mirror, I wondered whether they were ever going to turn brown and so decided on applying another layer of tan for good measure and happily daubed another layer in the vague direction of my legs. When I woke the next morning I was met by the sight of black ankles and knees and strange streaks decorating my shins. Through process of elimation I found that pumice stones and loofahs do nothing to remove fake tan (but only after I'd removed most of the skin on my ankles). What does work is Simple eye-makeup remover pads...the branding would imply some purity to the ingredients, but I now believe them to be saturated with something akin to paint striper. The moral of this story is don't drink and tan (note to self). What do you have planned this weekend? After the fun of yesterday's post where I put increasingly strangely shaped animals into differently sized sleeping bags, a friend and I (Friend Jenny, she of the Marie Claire Idées stash) discussed the possibility of turning it into a gameshow for television, with the catchy title of 'But will it Fit..?' After much deliberation we decided that Loyd Grossman would be the ideal compere for such a show. Those who spent their childhood in England may remember a television show that he hosted in the 1980s called 'Through the Keyhole' in which he snooped around a celebrity's home, giving clues as to whom it might belong, to the panel in the studio. His tour would always end with him posing the enquiry in his distinctive drawl: 'But who'd live in a house like this one?' before throwing it over to the panel for debate. I think he'd be perfect for 'But will it Fit...?' and I will be approaching his agent shortly, if he doesn't find me first, because I'm sure he's quick on the draw when it comes to winkling out an opportunity, no matter how obscure. Anyway, this post wasn't meant to be about the spin-off television series, it's about sleeping bag inspiration. 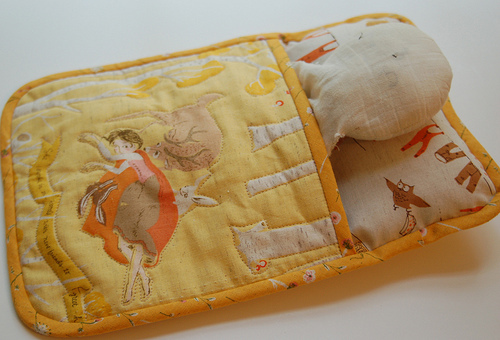 I wanted to share with you some of the beautiful sleeping bags that Michelle of City House Studio created. Michelle very kindly tested the pattern for me and made two sets to house the bunnies and sheep in her own household. If you haven't come across Michelle's blog yet, then do go and have a look - I'm rather in awe of her quilting skills and so it felt like a real privilege to have her testing my pattern for me. One of my favourite posts is this one - anyone who loves the children's author Eric Carle will love what she's created. I love the idea of having sets of sleeping bags! For the set above, Michelle used a lovely curving zig-zag to quilt the quilt cover. Whereas on this set she used free-motion quilted the tops...I still haven't learnt how to do this properly and so feel rather envious and am determined to give it another go soon. These are Michelle's sleeping bags from the back. When I gave a sleeping bag to one of my daughter's friends she was delighted to find that if she turned it over like this then her bear could use it as a day-bed without a cover too. I've always been inspired by the mini-quilts that people create - in some ways I find these more satisfying than the larger quilts as often they will have a pictorial focus or the work will be more intricate. So on that theme, I created a very simple applique flower to decorate one of the sleeping bags that I made during writing the pattern - it's nice to be able to get so many different pieces of fabric into one small shape! You might remember that I recently put a tutorial together for making a star block, seen in the sleeping bag below. I added a border to the edges and was left with a good size for a quilt cover for Daddy bear-sized sleeping bag. Finally, I wanted to share with you what fast-worker Amy has been been up to. Again, Amy's blog is one that I've recently fallen completely in love with. She makes adorable things and so I was loopily happy that she decided to turn her attention to making a sleeping bag from my pattern. She posted this on her blog yesterday and you can read the full details here, as well as seeing more pictures and finding out the lovely history of the beloved creature in the bed. Heather Ross fans will recognise the print. I love the way that Amy has quilting this, carefully stitching around the pictures, which makes them stand out even more. Amy sells many of the fabrics from this range in her delicious Etsy fabric shop, Pinked Fabrics. For those in the UK interested in doing similar, then I've noticed that Kate has some Heather Ross 'Owl & the Pussycat', along with some dreamy roses in her sale here. I think that just about wraps up everything on the bears' sleeping bag front for now! I'm really sorry for the deluge of posts on the subject - I wanted to get everything in one place straight away for anyone who's bought or is thinking of buying the pattern. By contrast, the next post is, I think, very likely to be focusing on grown-up dresses! Following my last post introducing my new Three Bears' Sleeping Bag pattern, this post has been written with the hope that it will help if you feel you want further advice as to the right size sleeping bag to make for your bear, doll or other creature. The Three Bears' Sleeping Bag pattern comes in three sizes: Baby Bear, Mummy Bear and Daddy Bear. Each of those sizes comes with a maximum height suggestion, but because bears and other toys are all such very different shapes it's more difficult to advise when it comes to establishing a maximum circumference, so these visuals may help. Baby Bear - maximum height of bear 8"
Mummy Bear - max height of bear 10 1/2"
Daddy Bear - max height of bear 13 1/2"
The picture above shows how a bear may look on the pattern piece when the sizing is just right. You can see that each creature has a nice amount of space around it at the top and the bottom, and they don't look like they will strain the side seams either. These bears are all healthy, active bears who haven't overindulged in honey...so it may help to show the suggested sizing for a more rotund bear. When it comes to making a bed for any size or shape of creature, the main thing to keep in mind is that the squashier and softer the bear, the more able he will be to fit into any bag, as long as the height recommendation is followed. Harder-bodied bears and animals should receive a bigger sleeping bag if you are unsure whether the size that suits their height will actually accommodate their width. To demonstrate this I've taken our largest bear, who has an impressive girth. ﻿You'll see that in every way he's bursting over the sides of the Daddy Bear sleeping bag size. However, because he is incredibly soft and squashy, he can actually fit in the finished bag, even though really he should have had a larger one made for him (at his height, he certainly should have done, but I'm just trying to demonstrate circumference issues here). A harder-bodied bear that is less malleable should always receive a sleeping bag that is a little bigger. Please ignore the obvious height breach here: this is to demonostrate circumference. While the bear below isn't overly tall, because of his full tummy and legs that don't lie flat, it's best to go up a size. He fits in the Daddy bear sleeping bag and it's a very comfortable fit with plenty of growth room. I thought it may also be helpful to cover four-legged animals too, because lots of children I know favour these over bears. Four legged creatures generally have a bigger circumference than a bear might, so in every case it's worth sizing up, even if the length of the creature fits neatly into a smaller size (again, if the animal is squashy, you're fairly safe). But what if your animal is long, hard-bodied and four-legged, like this sausage dog? As you can see below, he's not the ideal candidate for such a bed, but that won't stop a child from enjoying tucking him up, so make the largest size for him. The most peculiarly-shaped animal that we own is this reindeer that came home from Sweden with us. You'll see that he is very statuesque, has a hard, unyielding body and antlers that are a little wild. But with the largest bed size, even he can be accommodated. It's worth remembering that while the pattern comes in three sizes, if your intended bear or creature has outgrown these, the pattern is very easily increased on a copy machine at the local library or print shop. If you're interested in buying the pattern, you can find it for sale for instant download here.